Essay from the year 2007 in the subject English - Literature, Works, grade: 1,3, Free University of Berlin (Englische Philologie), course: Historical Novels Through Time, 5 entries in the bibliography, language: English, abstract: Our time of demystified heroes and legends, has only a vague understanding of history and struggles for its interpretation. History in this context does not only mean the mere sequence of specific incidents and events that cannot be changed retroactively by any access to the past. This concept is furthermore a discussion on these events that is their interpretation. That means that history is and in this form it is most likely to be perceived, the connection of object and subject, referring to the events in the temporal past and its spectator in the present. This creates a subjective ribbon that connects temporal past and present by dint of an interpretive frame. Indeed the past cannot be changed, but its interpretation and analysis can be. This is exactly the approach of Stephen Fry who provides with his novel Making History a possible answer to the question, how Germany and the world might have developed without Adolf Hitler. Supported by historical facts and enriched by fictitious elements, Fry's novel affords the reader a manual for the exposure to one's own past and distorts the understanding of history of the broad majority who ascertains a single man, Adolf Hitler, to be the root for all evil. The following text tries to analyze the role of historical fiction for one's accomplishment of history in general and how Fry in particular does away with the common view that history is barely more than the sequence of big men's big actions. Therefore, I would like to proceed from the assumption that Making History is a critical metaphor for the work of historiographs who create history by interpreting, omitting and stressing of historical facts. The novel also expresses one's responsibility for the past one builds his present and future on. 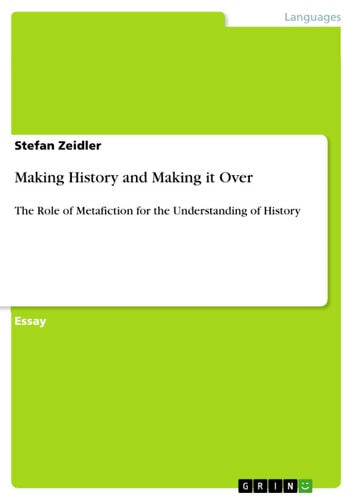 Fry uses his protagonist's thesis, the 'Meisterwerk' as a metafictional element to clarify the meaning of historical fiction for developing the understanding of history. Furthermore I will try to clarify the novel's affiliation to the genre of metahistoriography after a short theoretical digression about this literary field.